Geek Bear's Den | A bear's viewpoint on geeky things. I’ve said that often here and I am a firm believer in it. One of the places where representation is sorely lacking for the Queer community is superhero comics. 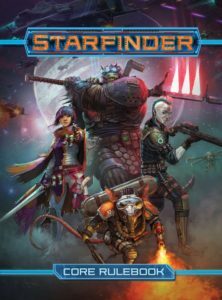 You can look to the Big Two and there are only a handful of queer characters and even less that are the star of their own books. I am a fan of superhero comics and the absence of characters that I could identify with is always a sore spot. 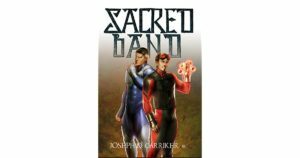 Joseph D Carriker Jr is a superhero in his own right and has swooped in to my rescue with his novel Sacred Band. Joseph sets about creating a world similar to our own. The pivotal factor being an event that struck around the world causing devastation and creating the world’s first empowered individuals. These people, referred to as the originals, are very similar to the Justice League or Avengers of the Big Two but down play the god level abilities that are normally associated with these groups. After these events, there continue to be Echoes that occur around the world. These create more powered individuals some of which do not survive their empowerment. 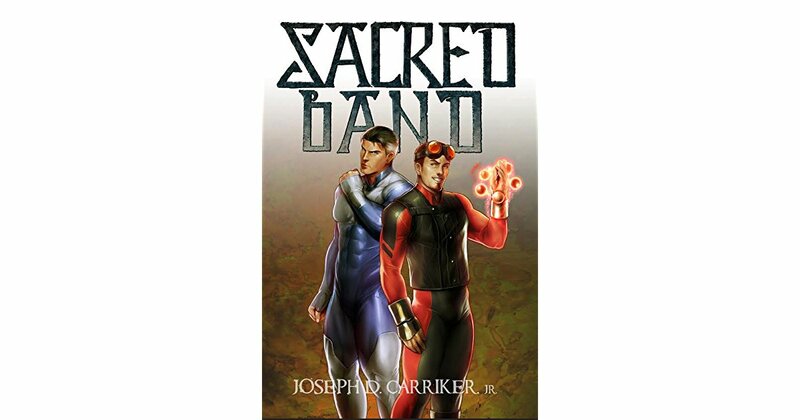 Sacred Band picks up the story of a small group of queer super powered individuals in 2013. Gauss is a young man attending college in Portland Oregon. 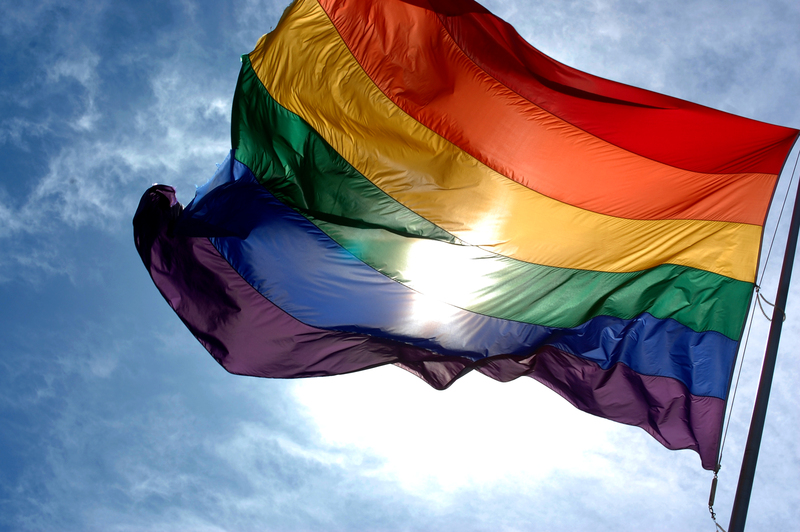 He is open both about his sexuality and his empowered status. Deosil is a young woman with deep roots in the pagan community who struggles with the difficulties of being trans while learning more and more about her elemental powers. Optic is an Ex-Seraphim. He was drummed out of the Air Force for being gay right before the repeal of Don’t Ask, Don’t Tell. He has used his ability to transform into light and fly to create a career in Hollywood for himself. Llorona is an older woman who works for the Golden Cross using her sound based powers to rescue victims of natural disasters and echo events. Last but not least is Sentinel. He is one of the Originals and very much a Superman Analog. He was a member of the first superhero team but has since vanished from the public eyes when he was outed back in the time when being gay was completely unacceptable from an icon. Joseph gives the reader everything they would expect from a superhero novel. there is action that is well choreographed and flows well across the page. He treats it with a lyrical tilt that was refreshing to read. 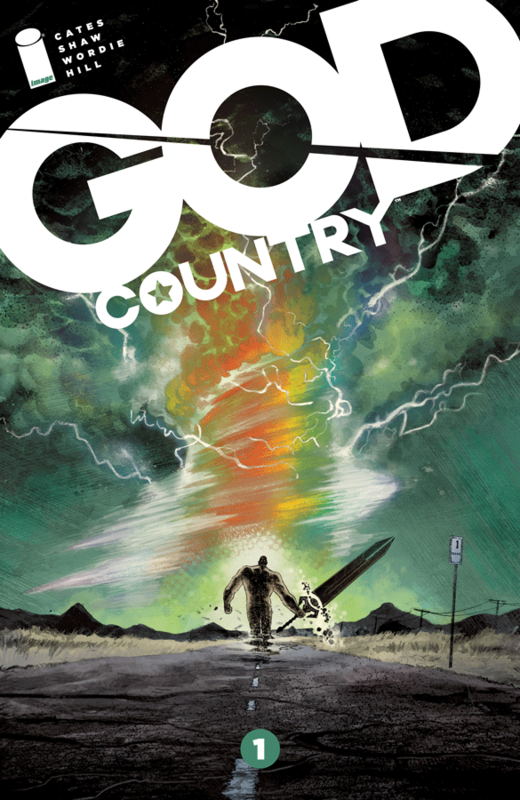 There are secret identities, vague yet menacing governmental agencies, conspiracies, and globe-trotting adventure. Unlike Icarus, Joseph keeps his characters grounded. They all have incredible powers which are put on display for the reader. Instead of dominating the narrative, they complement the humanity that fills each of these individuals. There are poignant moments scattered throughout this book that make my heart weep and sing. There is a scene where Deosil is at a Pagan conference and is giving an interview. The interviewer pushes the point of asking about her dead name. The conference comes to her rescue and escorts the offender out but it highlights the struggles that a trans person faces every day and gives voice to it within the pages of this book. The narrative touches upon the difficulty of coming out and being outed at different times in history as we hear how Sentinel faced such public outrage for being gay while the cost, though steep for Optic, was not a life of exile. Joseph takes the time to delve into the difficulties of dating as a member of the queer community. These human moments could have easily been overshadowed by super powered antics and melodramatic tentpoles. Instead, Joseph made them the heart of his story and has created something that transcends the genre. I was drawn into the lives of the characters and felt both their love and their loss. I was both sad and elated at the end of the book. I was sad that the story had ended but elated that I had found a story that both represented me in the story and embraced the superhero genre that I love. Don’t click the x button up at the right corner of the page! Hear me out and all will be made clear. So, you did read the title of this post correctly. I am going to talk about a comic that is based on the old time sleuthing team of Nancy Drew and the Hardy Boys. I know the name itself conjures up cute kitschy ideas of rich kids exploring safe mysteries in a manner more vanilla than Scooby Doo. Del Col and Dell’Edera take a healthy dose of noir and blend it with the old stories to create something modern. They do this without falling into the trap of being ultraviolent. The team does this by accepting the history of these characters and dealing with it quickly. They do this in their description of Bayport, the home of the trio. They call it a postcard, a place trapped in time designed to bring people to the area to enjoy an idyllic time gone past. The creators call out the feeling of these characters being frozen in place and then shatter the ice on the next page. Gone are the perfect children that parents would hope for. In their place are modern young adults that are easy to identify with. 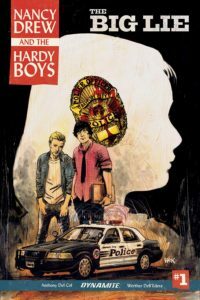 The Hardy Boys are young adults whom are suspected of their own father’s murder. They are now at the mercy of the same police whom their father had shielded them from prior. Gone is a relationship between two brothers that were inseparable. 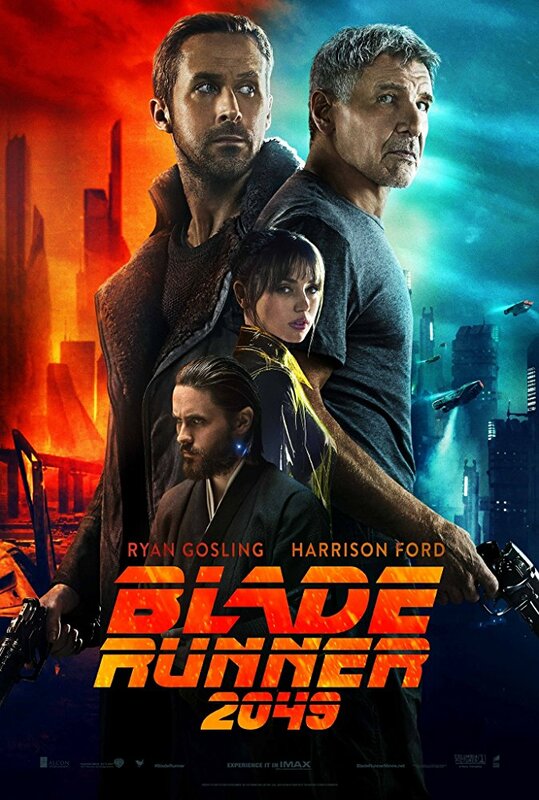 In it’s place is a more realistic relationship of two young men that have to figure out who they are and what they are going to do with the shattered life that they now live after the death of their father. Del Col does an excellent job of blending in the bits and pieces of the history of all the characters that populated this long line of books. I was most amused by repeated references to the Bobbsey twins. He makes these characters accessible without being leaning heavily on nostalgia or over-top-antics. He brings in the tropes that I enjoy from noir and hardboiled detective fiction and gives them a softer edge that makes this book something that lovers of both crime fiction and these characters can enjoy. All of this is supported by the wonderful art of Werther Dell’Edera and colorist Stefano Simeone. These two create a visual world that captures the essence of the covers of the Nancy Drew and The Hardy Boys book covers. From the very first page you understand that these two have a grasp of the history of these characters. They use lines and a color palette that evokes these old books while also enhancing noir story that is running through the book. In particular, the very last page of issue one does a character introduction. It is a single page with the character framed by the Hardy Boys. To me, It has that feel of Bogart in the Maltese Falcon that screams classic noir/hardboiled detective and sealed my love for this title. Trust me when I say that you should give this book a try. The creative team takes something that could be saccharine sweet and creates a mystery worth following. Four bear paws out of four. I bear-illy recommend it! 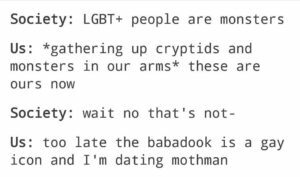 It’s pride month and I want to talk about comics. To do this, I want to talk about a book that tells an excellent story while still embracing queer content. Heathen is just such a book. It is written and drawn by Natasha Alterici. This is her creator owned title which she funded on Kickstarter back in 2015. She has done work on Gotham Academy and Grayson. 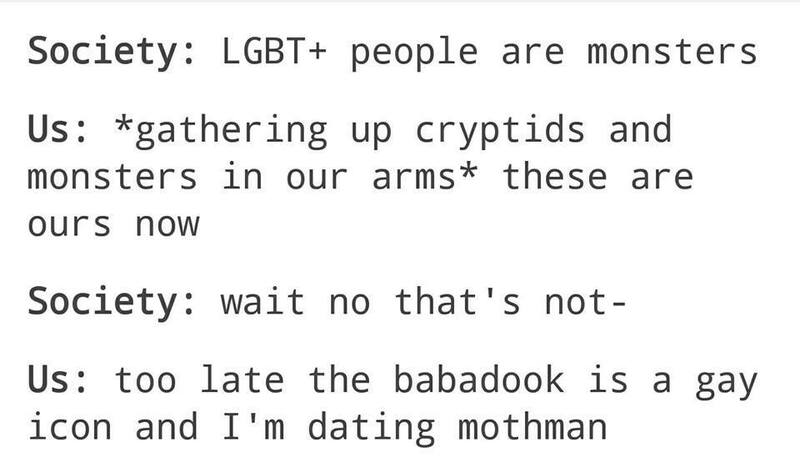 She is also a member of the LGBT community. Heathen is a reimagining of Brynhild legend from Norse Mythology. Alterici does an excellent job of getting someone unfamiliar with Norse Mythology caught up on the story. Our heroine, Aydis, tells the story to her horse as she begins her journey. As she winds the tale up, she shares how long the story has passed down through her clan and laments that Brynhild has been waiting to be free for a very long time. The exposition feels very much like a story that a skald would tell over a fire to enthrall a mead hall. The art that supports the story is evocative. It has a rough hewn quality that feels like a gritty dream. The core point of the myth is that Brynhild is rescued by a brave warrior whom she is then required to marry by the decree of Odin. Aydis has taken it upon herself to free Brynhild from her captivity and the consequences be damned. Aydis, you see, has nothing left to lose. Her village thinks her dead as she was condemned to death when she was caught kissing another woman and did not deny that she did this of her own free will. It hits on all the things I love and want. We have mythology remade. I am familiar with the Brynhild story as well as the variations on the theme that can be found in Wagnerian operas. Alterici takes the story and blends in a modern sensibility with social justice themes. Her wild concoction is exhilarating. She gives us a book with a queer hero that is not afraid to be who they are and this makes my heart skip a beat. 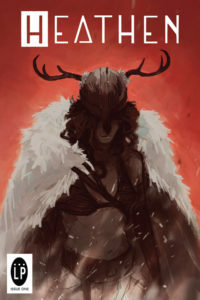 And in the process, gives us a modern Norse Myth where the hero is a woman to boot. It has been long overdo and the power of the story is amplified by this choice. The art is gorgeous as well. It has a deep scratchy feel with rough hewn edges. It has a warmth and authenticity that adds to the story being told. In particular, I like how Alterici’s style makes the brief combat with a bull in issue one is handled. The action is quick and fluid without anything feeling blurry or hard to follow. The detail is never lost in the flow of the conflict. 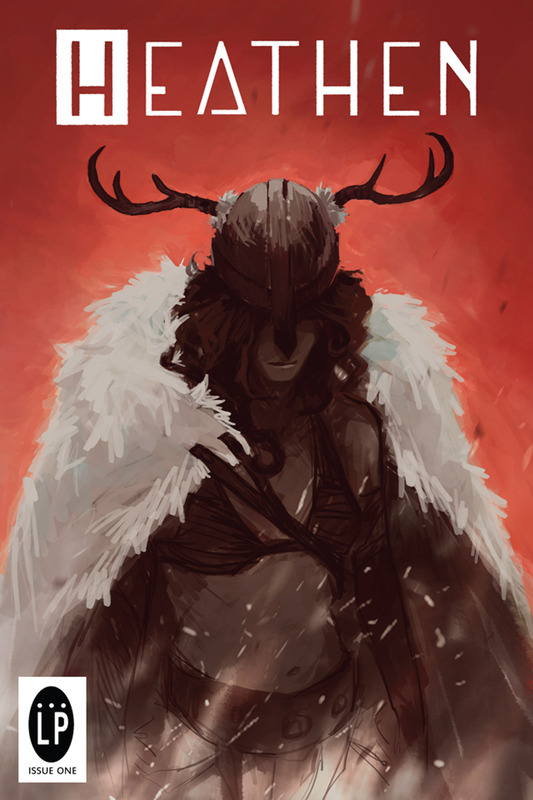 Heathen by Natasha Alterici is a book that needs to be on your pull list. Great story, excellent art, queer content, A strong Heroine,socially aware themes, and mythology remixed. What’s not to love! It is currently on issue four so it will not be difficult to get caught up.